With hugs and handshakes – as well as lattes, scones and gelato – patrons and leaders of Wichita First United Methodist Church gave a farewell to Mead’s Corner, the downtown coffeehouse it has operated for 10 years, on July 29. “We celebrate not only Mead’s Corner, the place, but also Mead’s Corner, the people,” said Leslie Coates, who leads a contemporary service called The Gathering on Sunday nights. Citing a steep rent hike for the space at 430 E. Douglas St., Wichita First UMC leaders made the decision to close the coffeehouse, effective July 28. The final day was packed for a goodbye to the facility. The Rev. Dr. Michael Gardner, pastor when the coffeehouse was opened in 2008, recalled skepticism from some church members that the business would be a good fit for its mission. “It is possible for old wineskins to give way to new ideas,” Gardner said. The Rev. Kent Rogers, Gardner’s successor, recalled introducing himself to a person in Wichita as the pastor of First UMC. When she wasn’t sure where the church was, her face lit up when she was told it was the church that operated Mead’s Corner, he said. “You knew there was something big about this place,” Rogers said. Rogers said the location went beyond being an outreach to the community, serving as a place where city officials and community developers met to discuss future endeavors. “This has been a place of organic partnerships long before we made it a location of spiritual outpost,” Rogers said. The previous incarnation of Mead’s Corner was a bar with a high crime rate, including a high rate of human trafficking, Rogers said. When the church took over, it became a focal point of ICT SOS, a group dedicated to fighting human trafficking in Wichita. Watson credited Mead’s Corner as one of the key factors in the turnaround of downtown Wichita, which boasts new retail, office space and dining and nightlife options that were unheard of in 2008. Former employees were asked to stand during the ceremony, and patrons were told that the baristas at Mead’s Corner never kept their tips, instead giving them to Wichita First’s ministry. 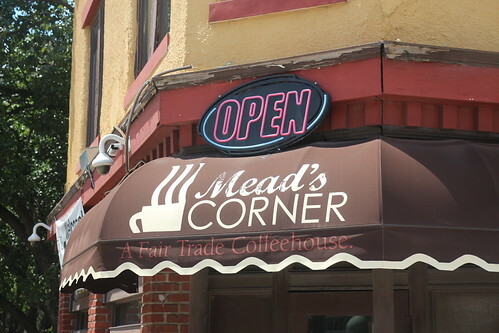 In the decade that Mead’s Corner was open, more than $90,000 was raised from tips. While Mead’s Corner has closed, The Gathering will live on in a new location – in the New Covenant United Methodist Church’s Life Support Center, at 1718 W. Douglas St. in the city’s expanding Delano district. “We anticipate all kinds of new stories to tell later,” Coates said. Watch a video of memories from Mead’s Corner.